This website was created to provide the public with systematic nationwide information on the conduct of the 2011 presidential election based on data from Quick Count observers. It is designed to inform preparations as well as to serve as a baseline for assessing the quality of the 2015 presidential election. The Quick Count data is based on reports from a representative random sample of polling stations from every part of Nigeria. 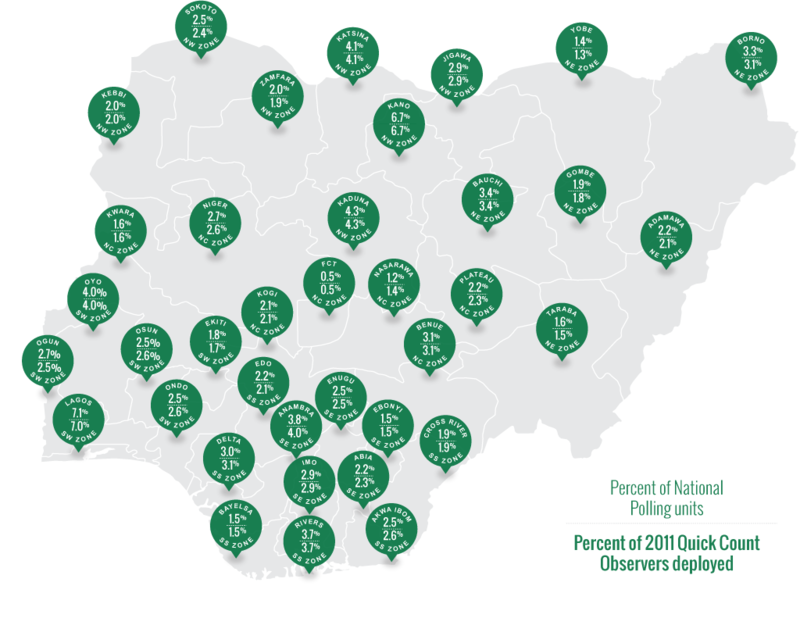 For the 2015 presidential election, the Transition Monitoring Group (TMG) again plans to systematically assess the process and to provide independent verification of the official results by conducting Nigeria’s second national Quick Count. Prior to 2011 elections, each of the Nigeria’s three national elections since the end of military rule had been found to have been worse, rather than better, than the one preceding it. Nigerians argued, in particular, the official results did not reflect the ballots casts at polling units. As a result, there was little public confidence in the Independent National Election Commission (INEC). Concern was so great that some believed another poorly conducted election could undermine the basis for civilian authority and might lead to a return to military rule. Two important changes enhanced public confidence in advance of the 2011 elections. First, Professor Attahiru Jega was appointed as the new Chair of INEC. He was widely perceived as nonpartisan and had the backing of civic groups. Second, under Professor Jega, INEC adopted a new voting system based on the one used for the 1993 presidential election. At the time, Nigerians widely viewed this election as the most credible in the country’s history and civil society championed this approach. While these developments improved public sentiment, overall confidence in INEC remained low as fears the official results could be manipulated remained high. In response, a consortium of civic organizations undertook to conduct a Quick Count for the presidential election under the banner “Project 2011 Swift Count.”1 This effort involved a total of nearly 8,000 citizen observers – including deploying nearly 3,000 trained, accredited non-partisan observers to a representative random sample of approximately 1,500 polling units located in all six geopolitical zones, all 36 states (and the Federal Capital Territory), and all 774 Local Government Areas (LGAs) for the 2011 presidential election. 1: Project 2011 Swift Count was a joint initiative of the Federation of Muslim Women’s Associations in Nigeria (FOMWAN), Justice, Development and Peace/Caritas Nigeria (JDPC), the Nigerian Bar Association (NBA), and the Transition Monitoring Group (TMG) to conduct a Quick Count for the 2011 presidential election. The Quick Count, also known as parallel vote tabulation (PVT), is a proven methodology employed by nonpartisan citizen observers to independently verify official election results. A Quick Count is based on systematic assessments of voting and counting processes. Unlike exit polls, PVTs do not ask citizens how they voted, rather they rely on trained observers collecting data at polling units. This data is then analyzed to produce highly precise estimates of both the official results and the conduct of voting and counting on Election Day. Quick Counts, properly done by citizen groups, reduce uncertainty from the election environment by providing careful analysis of observer findings. They most frequently confirm official results and increase confidence in well run elections. Where PVT’s expose fraud, or identify problems in the process, they provide an objective basis for understanding the negative effects and for seeking peaceful resolution of complaints. Quick Counts, thus, reduce potentials for political conflict. Transition Monitoring Group (TMG) is the foremost independent election observation group in Nigeria. Established in 1998 as a non-profit, TMG now has over 400 member-organizations (located in all six geopolitical zones and all 36 states plus the FCT). TMG and its members are committed to the entrenchment of democracy in Nigeria after more than 30 years of repressive rule. TMG’s approach to the rights, responsibilities, and ethical obligations of non-partisan citizen election monitoring are drawn from the “Declaration of Global Principles for Nonpartisan Election Observation and Monitoring by Citizen Organizations.” Thus, TMG bases its work on the precepts that: 1) the authority of government derives from the will of the people expressed in genuinely democratic elections; everyone has the right to participate in government and public affairs, including by seeking to be elected and to vote in genuinely democratic elections; and 3) elections therefore belong to the people, and citizens have a right to know. TMG is a member of the Global Network of Domestic Election Monitors (GNDEM), as well as the West African of Election Observer Network (WAEON). Attached are preliminary statements on the 2011 Presidential Election based on Quick Count data. Please note that the figures in these statements are preliminary and may very slightly from the final figures on this website. The information contained in this website should be considered the final and authoritative Quick Count data for the 2011 presidential election. The above PDF Files can be viewed using Acrobat® Reader®.